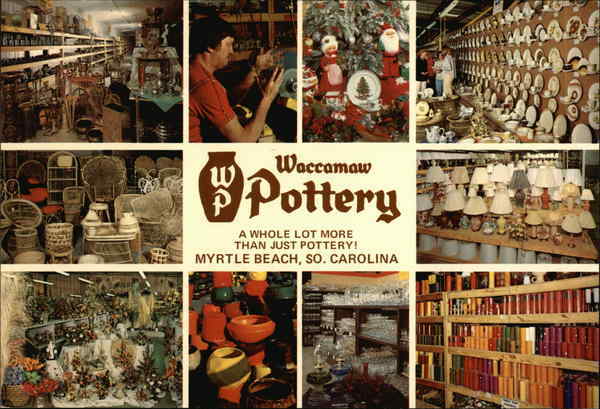 Did you know: Waccamaw Pottery/Shops was one of the largest outlet malls in the U.S.? That's right, Waccamaw Pottery/Shops was once the third-largest outlet mall in the United States. "The original Waccamaw Pottery building in Myrtle Beach is still standing, part of the nearly empty Waccamaw Factory Shoppes complex, once the nation's third-largest outlet shopping complex with more than 100 stores in 750,000 square feet of space on 80 acres. A fourth section was added in 1998 and a renovation of the entire complex was announced in October 2000. Competition from Myrtle Beach Factory Stores, however, was hurting the complex. Also, in December 2000, American International Life Insurance Co. foreclosed on owner Outlet Park RPFIV Associates LLC after a missed payment on a loan. A planned bridge over the Intracoastal Waterway was expected to help the area, along with turning a section of U.S. 501 into a freeway. Some believed the complex could make a comeback, with help. But additional competition was coming from Tanger Factory Outlets as well as a conventional mall nearby. In December 2001, AIG bought the property in an auction. Talk of a theme park began, though some believed the mall could remain. In August 2003Horry County Council voted to rezone land for the theme park, and by 2005 Hard Rock Park, a now-defunct music-themed amusement park, appeared likely to become a reality. But the mall had two stores, the upgrading of U.S. 501 had decreased interest in an area that became hard to reach, and AIG had its own problems. The bridge that was supposed to help the area had no funding, though work on extending Harrelson Boulevard past an interchange on U.S. 17 Bypass was set to begin. One of the Waccamaw facility's buildings was used seasonally as a rehearsal location for the Radio City Rockettes." Thanks to some investigating by those /r/MyrtleBeach Reddit kids, more than likely for the Myrtle Beach FAQ page, this little nugget of Strand history comes our way. Hat tip to Redditor 'the-mp' for the find.